A qingbai tripod incense burner of archaic bronze ding form. The body is of compressed spherical form and extends up towards a slightly flared faceted neck that terminates in a flat, wide, foliate rim. Two rectangular handles are attached to the top of the rim. The main body of the incense burner is impressed with six spherical panels. Three feet in the form of stylised elephant heads with well-­defined eyes and ears, and with elongated trunks, support the body of the vessel. 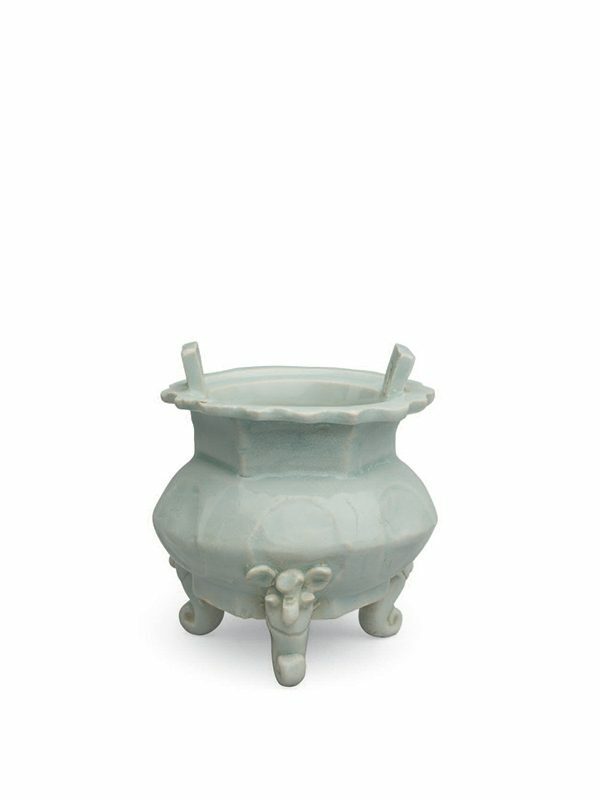 The incense burner is covered in a transparent glaze of pale blue hue, leaving only the base of the body and most of the interior unglazed, showing its original fine porcelain body with some areas of orange firing stains. Qingbai porcelain incense burners that take their shape from archaic bronzes were popularly used during the Song dynasty (960 – 1279), but are usually of typical ding form with rounded body and straight feet. Qingbai incense burners of this facetted ding form are extremely rare. The overall form of the body, sharp angle of the handles and the foliate rim all indicate that this piece was produced as an imitation of a metal prototype, dated to the late Southern Song dynasty (1127 – 1279) to early Yuan dynasty (1279 – 1368). A similar qingbai tripod incense burner of ding form, closely comparable in its eight­-faceted body and the stylised dragon­-headed feet with elongated snouts, dated to the Southern Song dynasty, was unearthed from Suining city in Sichuan province, and is now in the collection of the Suining City Museum. Several other qingbai tripod incense burners of comparable ding form and with stylized animal­-head feet but with a more typical white hued Yuan-­dynasty qingbai glaze, are respectively in the collections of the Palace Museum in Beijing, the Chongqing City Museum in Sichuan province, and the C.P. Lin collection.